We are a Document Scanning company based in London and Manchester with more than 10 years' of experience in the UK, our scanning process goes through a strict supervision and we use the latest in image processing technology to guaranty the best results. Microfilm scanning is a way of extracting the data contained on Microfilm images and converting them to digital files which can be read on computers, tablets and smart phones. When microfilm is scanned it is run through a specialist scanner which is operated by hand to capture a digital image of what is on the microfilm itself. This image is then converted to a familiar digital format such as PDF, TIFF or JPEG depending upon preferences. 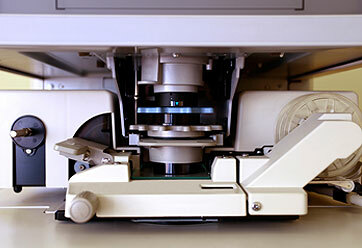 Microfilm Scanning has become a necessity as many organisations still hold documents on microfilm. Microfilm was a popular storage method during the 1980's and early 90's. Microfilming involves transferring documents onto a film reel as an image. These films can hold large batches of documents on each microfilm reel. However by today's methods the actual process of microfilming has been overshadowed by the more advanced and more convenient process of microfilm scanning and converting microfilm to a digital format. In this section you will find the process of scanning and digitizing all types of microfilm you'll also find out how here at Pearl Scan Solutions UK we can help you scan and digitize your microfilm. Microfilm are shrunken pages of information which have been put onto a film reel. A film on which printed materials are photographed at greatly reduced size for ease of storage. Microfilm Scanning is also called microphotography, the process consists in the reduction of images to such a small size that they cannot be read without special Microfilm readers. This photographic compression often results in a ninety-nine percent saving of space. The microfilm service is one of the most extensively used and common practices in modern reprographic industry. The increase in Microfilm Scanning is due to the recognition that a large portion of books, newspapers, manuals and diaries are deteriorating because of the poor quality of paper and print. The use of microfilming for almost seventy years has provided an excellent reproduction method for recording photographic images of printed materials. Up to 2,400 images of letter sized images. Up to 10,000 small documents eg. Cheques. 35mm roll film is most often used for large drawings such as plat maps and engineering blueprints. These A (8.5x11) through E size (44x34) drawings can be found in every Cities' Building Department and large architectural firms. The film is created by a photographic process and requires a development process to complete. The images are normally stored on small reels (300 to 500 images per roll), boxed, and hand-written identification is placed on the outside. Used for A2 to A0 documents. Often used for plans, blueprints and drawings. Up to 600 images of large drawings. Up to 800 images of broadsheet newspapers. The presentation of Microfilm in a cartridges is very common as this format protects the film for longer. Both 16mm Microfilm and 35 mm. Microfilm reels can be found within this presentation. They are also known as microfilm cassettes. 16 mm. film cartridge commonly stores A3 and A4 documents and you can get up to 2400 letter sized images on each reel. 35 mm. film cartridge commonly stores documents up to A0 size with up to 800 broadsheet pages or 600 large drawings. Simplex images have one document per frame. Duplex images have two images side-by-side on each frame. Many times the duplex images contain the front and back of the original source document. Our scanning operation have been audited and approved by many NHS, Local Authorities, Private blue chip companies to ISO 9001 (Quality Management System), ISO 27001 (Information Management System) and EMS 14001 (Environment Management System) and Data Protection 1998. Micorfilm Scanning Service in London, Manchester and rest of the UK. If you would like to read more about Microfilm Scanning, check out our blog for information and the lastest news from the world of microfilm.